To Sum It Up: Cassia and Ky have fallen in love with each other, but the Society has its own agenda and has sent Ky to the Outer Provinces. Out in this harsh environment, where there is talk of a rebellion against the Society, Ky and the Society's other Aberrations and Anomalies are being used as decoys to make the mysterious Enemy think that the Outer Provinces are inhabited and to draw the Enemy's fire. With Ky in grave danger, Cassia leaves her family and life in the Society behind in order to find him, despite being already Matched to Xander, her friend since childhood. Both Cassia and Ky must brave a rugged landscape and put their trust in people they hardly know as they fight to make their way back to each other. 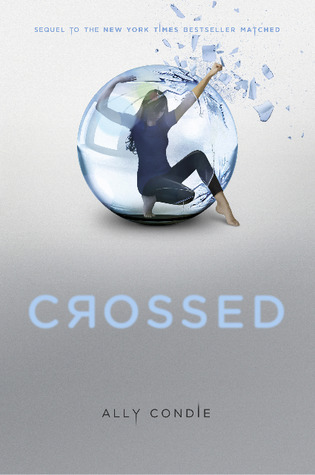 Review: Although I wasn’t wowed by Matched, I liked it enough that I wanted to check out the sequel, Crossed. One of my issues with Matched was the lack of enough action to really keep me glued to the pages. A lot of the time I felt like I was reading a traditional romance novel rather than a dystopian novel that had a romance in it. The protagonist, Cassia, also failed to win me over; I thought that her character needed more complexity to it. Both of these quibbles were remedied in Crossed, resulting in a faster-paced read that I couldn’t put down. In a departure from Cassia’s solo narration in Matched, Crossed alternates between Cassia and Ky’s points of view. I liked seeing things from Ky’s perspective and learning more about him. He’s been thrust onto the front lines of the Society’s battle with the enigmatic Enemy. The Society is trying to contain the fighting to the Outer Provinces, and so those males whom the Society has deemed unfit for Citizenship have been dropped in the middle of the warzone to fool the Enemy into thinking that it’s attacking populated territory. Ky’s tragedy-filled life has given him a strong survival instinct, and he uses it to plan a daring escape from the village that he’s been jettisoned in. Ky also turns out to be a natural leader, like his late father, who was part of the rebel group known as the Rising. Condie made a very good decision to give Ky a voice in this book, and she did an equally excellent job writing his character. As Ky attempts to return to Cassia, she is trying to reach him in the Outer Provinces. Cassia has sacrificed a comfortable life back in the Society to find him, and her journey, unsurprisingly, is a difficult one. This arduous mission that she has taken upon herself forces Cassia to toughen up considerably. She matures quite a bit in this book, and I found her to be a much more compelling heroine than she was in Matched. I give her a lot of credit for trekking through rough terrain and not whining about it. A few new faces appeared in Crossed, and their addition was welcome. I liked both Vick and Eli, who escape from the village with Ky. The latter decides to save Eli because he reminds Ky of Cassia’s younger brother, Bram. Vick is just cool, and he was my favorite among the new characters. Cassia’s traveling companion, Indie, who is in the same work camp as Cassia at the beginning of the book, is a rather shifty figure. It’s hard to tell whether she’s a friend or a foe to Cassia. I can picture Indie striking out with some readers because of her dubious behavior, but I thought that it lent edge to her character. And what news of Xander, the young man who is Cassia’s Match? Well, Xander only shows up very briefly in Crossed, but we learn some extremely interesting information about him. Going into specifics would head into spoiler territory, so I’ll just say that Condie needs to address all of the questions that I now have about Xander in the final installment of the trilogy. I wish that there had been some more explanation about who the Enemy was, but that was my only gripe about this novel. Obviously, I enjoyed Crossed a great deal more than I did Matched, and I can’t compliment Cassia’s character development enough. I hope that she continues to grow in Reached, which I added to my TBR list as soon as I finished reading Crossed. All in All: The pace and action really pick up in Crossed and are the main reasons why I zipped through it. I had planned to drop this series if Crossed turned out to be a repeat of Matched, but it was far from it. Based on the ending of Crossed, Reached looks to be a thrilling finale that I look forward to reading. Glad you say the action picks up, Lee. I tried Crossed when it first came out and the first two chapters didn't pull me in, so I set it aside to try again later. I simply haven't gone back, but your review's got me thinking I simply needed to read on a little more. I thought that Crossed had a more dynamic feel to it; the characters, especially Cassia, were finally on a real adventure. I hope that the book works out for you if you decide to pick it up again, Katja! Glad to know that Crossed was better than Matched. I read Matched when it came out and really didn't like it (apart from the beginning of the book) ... Great review Lee ! Thanks, Elodie! Matched didn't exactly bowl me over, either, but I was still curious to find out what happened. I think that the pacing and the character development are more finely tuned in Crossed and are what helped to make the difference. Matched was a so-so read for me, but I'm glad that I stuck with the series. I'd love to hear what you think of Crossed!